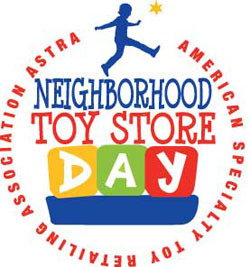 Neighborhood toy store day is Saturday, November 10, 2018. It's a once a year event. We had a fantastic time last year hosting a whole day of activities. We're busy planning this year's event, activities, giveaways and other fun stuff! We will continue to update this page as the planning progresses. We're donating 25% of the proceeds to Hope Center For Children, a local charity that helps children right here in our area. It's important for us to give back to the community who supports us, and particularly fond of charities that benefit children! Save the date to join your neighborhood toy store as they celebrate during Neighborhood Toy Store Day on November 10, 2018! This is a day to come together and celebrate the special role that neighborhood toy stores play in their communities. Special programs including crafts, local entertainers, scavenger hunts, product discounts and charity drives will be available on that day. One year, Kidding Around in New York, NY even got a very special visit from Kevin Bacon. You can use this day to kick off the holiday shopping season. Join your neighbors, support your local economy and inspire your child with the best toys on the market. Be a part of the action and support your local toy store and a local charity at the same time !